A spectator holds one sponge cube in his closed hand, the magician touches his hand with a coin and the coin multiplies to two. The spectator then holds the two, and another touch of the coin causes them to multiply to three. 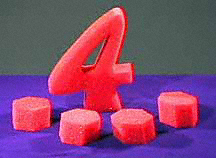 Finally the three cubes are plainly placed in the hand, "Would you believe there are four now?" asks the magician. He touches the hand with the coin and when he spectator opens his hand, he only has one but a larger one cut into the shape of a figure four. This is a simple, clean sponge routine that produces a great effect without any complicated moves or sleights.